Figure 1 shows the expected years of retirement for men who retire at the Social Security normal retirement age for a range of birth cohorts from 1912 to 1973 under current law.3 For men born between the years of 1912 to 1941 in the upper half of the wage distribution, there was a substantial increase in the expected length of retirement. Those born in 1912 could expect to live 15.5 years after turning age 65. This had increased by 5.5 years to 21.0 years for those born in 1941. The gain was much smaller for those in the bottom half of wage earners born in 1941, with the expected duration of retirement increasing by just 0.9 years from 14.8 years to 15.7 years. The increase in the normal retirement age will largely offset the expected gain in life expectancy for workers born in 1960. Assuming that there is no further increase in inequality in life expectancy, male workers born in 1960 in the upper half of the wage distribution can expect 22.2 years of retirement if they retire at the normal retirement age, 1.1 years more than the 1941 birth cohort. Workers in the bottom half can expect just 16.9 years of retirement. It is possible that the recent trend in inequality in life expectancy will continue over this period. In this case, workers in the upper half of the age distribution will see an increase of 3.0 years in the expected length of their retirement as shown in Figure 2. However, workers in the bottom half of the income distribution will see their expected length of retirement fall back by 0.2 years, to 15.5 years, the same number of years of expected retirement as the 1927 birth cohort. If recent trends in inequality continue, then workers in the bottom half of the wage distribution born in 1973 will still not be able to expect as long a retirement as workers born in 1941. Source: Author's analysis of Social Security Administration data (Waldron, 2007). Figures 1 and 2 show expected lengths of retirement under current law. However there are many proponents of increasing the retirement age. Figures 3 and 4 show expected lengths of retirement if the normal retirement age is raised by three years more than in current law, so that it hits age 70 for workers who are age 62 in 2035. This would imply an increase in the normal retirement age of two months a year beginning in 2012. In this scenario the increases in the retirement age largely offset the increase in life expectancy for the birth cohorts between 1941 and 1973. Workers in the upper half of the wage distribution born in 1973 can expect to live 21.3 years after reaching normal retirement age, 0.3 years more than workers born in 1941. This is shown in Figure 3. Workers in the bottom half of the wage distribution born in 1973 can expect to enjoy 16.2 years in retirement. If the recent trend of growing inequality in life expectancy continues through the next three decades, then workers in the bottom half of the wage distribution can anticipate substantial reductions in the expected length of retirement if the normal retirement age is increased in accordance with this schedule. A male worker born in 1973 retiring at age 70 can expect to live 13.8 years in retirement, a full year less than the expected length of retirement for a worker born in 1912, as shown in Figure 4. In this scenario, workers in the top half of the distribution will continue to see rises in the expected length of their retirement. These workers can anticipate 24.5 years of retirement if they retire at age 70. There has been a sharp rise in inequality in life expectancy by income over the last three decades that mirrors the growth in inequality in income. As a result, the bottom half of male earners have seen little gain in expected years of retirement over this period, if the age of retirement is held constant. The increase of the normal retirement age to 67 in current law will largely eat up gains in life expectancy for workers born in the 1960 cohort. This means that if these workers retire at the normal retirement age of 67, they can expect 1.1 more years of retirement than the cohort born 19 years earlier. If the recent trends in inequality continue, then workers born in 1960 in the bottom half of the wage distribution will see a modest decline in their expected years of retirement if they retire at the normal retirement age. If the normal retirement age is increased to age 70 over the next 25 years, as advocated by many policymakers, then the rise in the retirement age will continue to offset most of the increase in life expectancy. In the event that trends in inequality continue, then workers in the bottom half of the wage distribution will see a decline in the expected length of their retirement. For these workers, in the higher retirement age scenario, the expected years of retirement will be less for the 1973 birth cohort than it was for the 1912 birth cohort. If policy is designed to encourage people to work later in their lives then it is also important that the economy produce jobs that accommodate the needs of older workers. This does not appear to be the case at present, as nearly half of workers over the age of 58 work at jobs that are either physically demanding or involve difficult work conditions.4 Clearly more thought must be given to the implications of increases in the retirement age than seems to have been the case thus far. The number of survivors at each age x and income class were taken to be the average of the number of survivors at exact age x and x+1, so the probability of death at exact age x was computed directly from the table. The probabilities of death at each exact age and class for those born in 1912 and 1941 were computed from the exact-age populations. The log-probabilities of death at each age and class for years between 1912 and 1941 were linearly interpolated. Two extrapolations of the probability of death for each age and class were made. For the increasing-inequality case, the log-probabilities were linearly extrapolated at the 1912-41 rate of change for the specific age and class. For the constant-inequality case, a common rate of change in log-probability for each class was used -- equal to the average of the 1912-41 log rates of decline at each age. From the probabilities of death, life tables were constructed based on standard methods as described by Social Security.6 As a check of the methodology, the point estimates in Table 4 of the Working Paper7 were reproduced from the computed life tables. Life expectancies were then computed at normal retirement age under assumptions of current law8 and alternately under assumptions that the retirement age would be raised by two months for every year of birth to age 70 for those turning 62 in 2035. 1 It is worth noting that vast majority of workers retire at or near age 62, the year where they first qualify for reduced retirement benefits. 2 The trends in inequality in life expectancy are derived from data from the Social Security Administration on mortality: Waldron, Hilary. 2007. "Trends in Mortality Differentials and Life Expectancy for Male Social Security–Covered Workers, by Average Relative Earnings." Washington, DC: Social Security Administration, available at www.ssa.gov/policy/docs/workingpapers/wp108.html. See the appendix for a full explanation of the methodology. This analysis of the impact of inequality on changes in expected length of retirement is similar to an analysis by Morrissey, Monique and Emily Garr. 2009. "Working the Graveyard Shift: Why Raising the Social Security Retirement Age Is Not the Answer." Washington, D.C.: Economic Policy Institute, available at epi.3cdn.net/65bf2e24d59cf56166_dym6ive5s.pdf. 3 There is only data on differences on life expectancy by income for men. 4 See Rho, Hye Jin. 2010. "Hard Work: Patterns in Physically Demanding Labor Among Older Workers." Washington, DC: Center for Economic and Policy Research, available at www.cepr.net/documents/publications/older-workers-2010-08.pdf. 6 Bell, Felicitie C. and Michael L. Miller. 2005. "Life Tables for the United States Social Security Area 1900-2100." Washington, DC: Social Security Administration, available at www.ssa.gov/OACT/NOTES/pdf_studies/study120.pdf. The Associated Press's Robin Hindery reported on October 29, 2010 that the AP had found a remarkable fact: communities across the US have been raising their local property taxes. The AP surveyed 39 states and studied 2,387 revenue measures that came before town, city, and county voters. In most of those elections, voters favored measures that raised their own property tax rates. Voters wanted to support their local schools and other services provided by local governments. The AP began Hindery's story as follows: "Forget all the talk about voters being fed up with high taxes." So much for the surface of the story; just below it lie some facts about yet another huge mass of victims of capitalism's current crisis. High unemployment and falling home prices have combined to reduce the tax revenues of all 50 states and likewise the local property tax revenues of most cities and towns. The states have usually responded by cutting, among other outlays, their often substantial aid to cities and towns (helping to pay for public schools and many other local government services). So everywhere local governments are suffering doubly: reduced property tax revenues from local property owners and reduced state aid. This has forced thousands of local communities to lay off thousands of workers. In September 2010, for example, local governments across the US fired 76,000 workers, thereby offsetting the 64,000 additional workers hired by the entire US private sector that month. Many more cities and towns drastically cut their provision of local services -- just when people need more not less of them precisely because of the same crisis. Our citizens have become desperate to hold on to at least minimum levels of the local government services they rely on every day. In response, local governments have given their voters the option of raising their local property tax rates to pay for saving their services. And, as the AP reports, most are choosing to do that: to tax themselves extra to offset the costs of the economic crisis. Put plainly, in our economic system, its deep crisis has led local people to raise their own taxes to slow the shrinking of their local government services. Yet that is not the worst part of this story. Local property taxes in the US are among the nation's most regressive taxes. That means they fall on people regardless of their ability to pay. Where the federal government and most state governments have a more progressive tax system that requires upper-income earners to pay higher tax rates than lower-income earners, local property taxes do not work that way. For example, all homeowners usually pay the same rate of property tax, likewise all commercial and industrial property-owners. Finally, local property taxes in the US discriminate against owners of tangible property (land, homes, stores, buildings, automobiles, etc.) by taxing those kinds of property while NOT taxing intangible forms of property (stocks, bonds, etc.). In other words, while localities tax the tangible kinds of property fairly widely distributed among our people, they do not tax the intangible kinds of property mostly owned by the richest citizens. The result: the economic crisis is shifting an inequitable tax burden even more onto the shoulders of those least able to afford it even as they struggle to cope with the direct effects of the crisis (unemployment, foreclosures, etc.). This is yet another way in which the costs of a capitalist crisis are shifted from those who caused it to those already victimized by it. Hence the sad spectacle of people voting in local elections to reduce this disaster by further taxing themselves rather than changing a system that works like this. Capitalism proves itself to be a system whose workings not only generate repeated and often severe economic crises. It also systematically shifts the costs of that instability down the social scale to the majority in the middle and bottom. Este livro aborda o estudo de um dos mais complexos problemas da psicologia — a inter-relação entre o pensamento e a linguagem. Tanto quanto sabemos esta questão não foi ainda estudada experimentalmente de forma sistemática. Tentamos operar, pelo menos, uma primeira abordagem desta tarefa, levando a cabo estudos experimentais sobre um certo número de aspectos isolados do problema de conjunto. Os resultados conseguidos fornecem-nos uma parte do material sobre que se baseiam as nossas análises. As análises teóricas e críticas são uma condição prévia necessária e um complemento da parte experimental e, por isso, ocupam uma grande parte do nosso livro. Houve que basear as hipóteses de trabalho que serviram de ponto de partida ao nosso estudo nas raízes genéticas do pensamento e da linguagem. Com vista a desenvolvermos este quadro teórico, revimos e analisamos acuradamente os dados existentes na literatura psicológica pertinentes para o estudo. Simultaneamente, sujeitamos a uma análise crítica as teorias mais avançadas do pensamento e da linguagem, na esperança de superarmos as suas insuficiências e evitarmos os seus pontos fracos na nossa busca de um caminho teórico por onde enveredar. Como seria inevitável, a nossa análise invadiu alguns domínios que lhe eram chegados, tais como a lingüística e a psicologia da educação Na análise que realizamos do desenvolvimento dos conceitos científicos nas crianças, utilizamos a hipótese de trabalho relativa à relação entre o processo educacional e o desenvolvimento mental que havíamos elaborado noutra oportunidade fazendo uso de um corpo de dados diferente. A estrutura deste livro é forçosamente complexa e multifacetada. 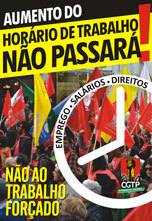 No entanto, todas as suas partes se orientam para uma tarefa central: a análise genética das relações entre o pensamento e a palavra falada. O primeiro capitulo põe o problema e discute o método. Os segundo e terceiro capítulos são análises críticas das duas mais influentes teorias da linguagem e do pensamento, a de Piaget e a de Stern. No quarto capítulo tenta-se detectar as raízes genéticas do pensamento e da linguagem; este capítulo serve de introdução teórica à parte principal do livro, as duas investigações experimentais descritas nos dois capítulos seguintes. O primeiro estudo (capítulo 5o.) trata da evolução genérica geral dos significados durante a infância; o segundo (capítulo 6o.) é um estudo comparativo do desenvolvimento dos conceitos “científicos” e espontâneos da criança. O último capítulo tenta congregar os fios das nossas investigações e apresentar o processo total do pensamento verbal tal como surge à luz dos nossos dados. (4) clarificamos por via experimental a natureza do discurso interior e as suas relações com o pensamento. Não é do pelouro do autor fazer uma avaliação das suas próprias descobertas e da forma como as interpretou: isso caberá aos leitores e aos críticos. O autor e os seus associados têm vindo a investigar os domínios da linguagem e do pensamento há já quase dez anos, durante os quais as hipóteses de que partiram foram revistas ou abandonadas por falsas. No entanto, a linha fundamental da nossa investigação não se desviou da direção tomada desde início. Compreendemos perfeitamente o quanto o nosso estudo é imperfeito, pois não é mais do que o primeiro passo numa nova via. No entanto sentimos que, ao descobrirmos o problema do pensamento e da linguagem como questão central da psicologia humana demos algum contributo para um progresso essencial. As nossas descobertas apontam o caminho a seguir por uma nova teoria da consciência, nova teoria essa que afloramos apenas no fim do nosso livro. O líder da CGTP, Carvalho da Silva, considerou hoje que este "Orçamento do Estado é a continuação para o abismo", acusando Governo e PSD de terem feito uma "encenação em torno de discussão de pormenores" do documento. Em declarações à Agência Lusa, Carvalho da Silva afirmou que "não há novidade nenhuma" no acordo a que chegaram Governo e PSD sobre o Orçamento do Estado para 2011. "Há um identidade absoluta entre o Governo e o PSD naquilo que são os aspetos fundamentais que estão nesta proposta do Orçamento do Estado, que conduzem ao empobrecimento generalizado dos portugueses e agravamento da pobreza para algumas camadas de uma forma muito violenta", condenou. O índice de expectativa da Marktest está no valor mais baixo de sempre, que se lê como pessimismo acentuado. Nem durante a recessão mundial os portugueses estiveram tão pessimistas como hoje, em relação ao seu futuro e ao do país. O índice de expectativas económicas da Marktest caiu para o valor mais baixo desde que há registo, fruto do anúncio do terceiro pacote de austeridade. Os dados de confiança do Instituto Nacional de Estatística (INE) deram o mesmo sinal. Um mês depois de ser conhecido o terceiro pacote de medidas difíceis, a confiança das famílias portuguesas caiu para o valor mais baixo desde Fevereiro do ano passado, em plena recessão mundial. A sondagem da Marktest para o Diário Económico e a TSF enfatizou o choque das novas medidas de consolidação das contas públicas. Em Outubro, o índice de expectativas caiu para o pior valor desde que há registos. Atingiu uma média de 14,45 pontos (significa pessimismo acentuado nas famílias), quando o valor mais baixo até aqui não tinha ido abaixo dos 24 pontos. Mais: O índice - que mede as perspectivas das famílias nacionais face à sua situação e do país no ano seguinte - estava em recuperação desde Junho, o que mostra o impacto que as novas medidas de austeridade tiveram na confiança dos portugueses. "É natural que a deterioração mais recente da confiança dos consumidores [medida pelo INE] seja parcialmente explicada pelas medidas de austeridade", avança João Loureiro, economista e professor da Universidade do Porto, porque "a situação financeira das famílias e a conjuntura económica são factores determinantes na evolução desse índice de confiança" e "estes dois indicadores serão directamente penalizados pelas medidas anunciadas no âmbito do OE para 2011". A taxa de cobertura voltou a cair e, em Setembro, eram cerca de 225 mil os desempregados inscritos nos centros de emprego sem apoio. Há cerca de 225 mil pessoas sem emprego e sem subsídio. Em Setembro, o número de desempregados sem protecção voltou a bater recordes e a taxa de cobertura ficou abaixo de 60%, um valor que já não se registava desde, pelo menos, 2005. A justificação do valor da taxa de cobertura em Setembro, face a Agosto, diz o Ministério do Trabalho, prende-se com "um crescimento em cadeia do desemprego registado (procura de novo emprego) de 0,48%, assim como pela redução do número de subsidiados em 3,2%". Neste segundo caso, sublinha o Ministério de Helena André, a variação decorre também da retirada dos apoios extraordinários em resultado do PEC II. 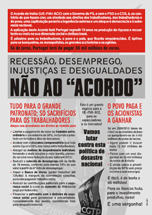 Recorde-se que em Julho, o Executivo retirou antecipadamente algumas das medidas anti-crise. Uma delas reduzia em três meses o período de contribuições necessário para aceder ao subsídio de desemprego; outra permitia que o subsídio social (atribuído a beneficiários de fracos rendimentos e insuficiente carreira contributiva) fosse pago por mais seis meses. Em Setembro, avançam os dados ontem publicados pela Segurança Social, existiam 331.092 pessoas a receber um dos quatro tipos de subsídio de desemprego (73% dos quais a receber o apoio principal). Olhando depois para os dados do Instituto do Emprego e da Formação Profissional (IEFP) são 555.820 os desempregados inscritos (mais 8% em termos homólogos e mais 1% em cadeia). Contas feitas, 40,4% dos inscritos não tem direito a subsídio (ainda que possa receber outros apoios). Isto no mesmo mês em que a taxa de desemprego se manteve inalterada nos 10,6%, segundo informou ontem o Eurostat. David Harvey : "Pour que le système change vraiment, il faut que les travailleurs se fâchent"
Longtemps boudé par le champ académico-universitaire français , l’anglais David Harvey est pourtant le théoricien marxiste le plus traduit au monde (avec Frederic Jameson). Ce n’est que justice : le penseur - pas forcément très simple d’accès, rien à voir avec Mike Davis ou Slavoj Žižek - est un décrypteur acharné du règne du capital. Surtout, ce théoricien de la Radical Geography a dépoussiéré l’héritage marxiste en lui adjoignant une dimension spatiale, posant l’étude des espaces du Capital comme préalable indispensable à une compréhension globale du monde tel qu’il tourne (mal). 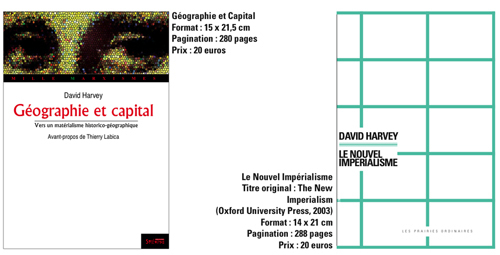 Pour cette conférence donnée à l’École d’architecture de Belleville , David Harvey s’est éloigné de la géographie pour se concentrer sur le thème des son dernier livre, encore inédit en français, L’énigme du capital. À partir d’une analyse basique des différentes étapes de la production, se focalisant sur la récente crise généralisée, il pointe les diverses failles du système et les inégalités criantes qu’il engendre. Avec cette interrogation, en toile de fond : puisque ce système est si mauvais, pourquoi ne pas en changer ? Deuxièmement, le système doit être en perpétuelle croissance. Pour survivre, il lui faut sans cesse s’étendre. Le surplus est réinvesti de manière à régénérer l’ensemble. Historiquement, ce système a eu une croissance globale annuelle de 2,25 % depuis 1780. Les économistes considèrent pourtant qu’à moins de 3 % de croissance, il faut s’inquiéter. Il est aujourd’hui de plus en plus difficile pour le système de trouver des marchés, des débouchés pour les nouveaux produits. On ne peut évidemment comparer ce qui se passait dans le monde occidental en 1780 autour de trois ou quatre villes européennes comme Birmingham ou Manchester à la situation actuelle. Les situations n’ont rien à voir, mais une règle se vérifie dans les deux cas : le taux de croissance annuelle ne doit jamais baisser ; s’il le fait, le système se grippe. Nous en sommes aujourd’hui à 55 trillions de dollars de production annuelle de biens et services, et ce chiffre augmente de manière exponentielle. À ce stade, pour que la machine ne s’enraye pas, il faut y réinjecter 1.5 trillion supplémentaire chaque année. Il y a depuis peu une évolution notable : les firmes non financières, celles qui produisent biens et services, réinvestissent de plus en plus leur argent dans des produits financiers, comme des swaps, des éléments dématérialisés. Il n’est plus rentable de continuer à produire, ça ne rapporte pas assez pour réalimenter le fonctionnement de la machine. Ce qui amène à se demander si le système n’est pas en fin de course : où se situent ses limites ? Pour répondre à cette question, il faut savoir d’où vient l’argent et comprendre comment le capital est constitué, comment il est configuré pour soutenir un système de production. Derrière ce fonctionnement, on repère ce que j’appelle la collusion finance/État, une forme de collaboration entre les institutions financières et l’État. L’histoire du capitalisme est marquée par les évolutions dans le fonctionnement de ce lien. Quand il a des ratés, nous nous retrouvons en situation de crise ; on en a un très bon exemple avec la répression financière de la fin des années 1960 et du début des années 1970. Beaucoup de gens se montraient alors très critiques, affirmant qu’on mettait trop de limites aux pouvoirs des financiers et que c’était un frein pour la croissance. À partir de là, la collusion finance/État a été réformée et encouragée : une dérégularisation croissante a été mise en place. Le système est ainsi passé de la répression financière du début des années 1970 à une exubérance financière, avec beaucoup trop de pouvoirs entre les mains des financiers. Cette collusion finance/État est toujours camouflée, elle reste dans l’ombre. Nous ressentons seulement sa présence en période de crise. Au moment de l’effondrement de Lehman Brothers, le Président des États-Unis a par exemple complètement disparu de la scène : ceux qu’on a vus à la télévision étaient le directeur de la Réserve fédérale (représentant du système bancaire) et le ministre des Finances. Il y avait une absence totale du chef de l’exécutif. À ce moment-là, c’est la finance qui prenait les décisions et les expliquait à la télévision. Alors même que l’État a absorbé les pertes des banques et, donc, de Lehman Brothers. L’autre limite visible du système est celle de la main d’œuvre. Pendant la crise des années 1970, la main d’œuvre était encore puissante face au patronat, et les syndicats pouvaient fortement peser dans la balance - notamment sur des questions telles que le salaire minimum. De cela découlait ce que l’on a appelé la constriction du capital, une situation où ce dernier restait encadré et limité dans ses agissements. La situation s’est depuis inversée. À l’époque, le système a réagi en délocalisant tout azimut. Pour mater les travailleurs et les syndicats, la meilleure solution était de s’installer ailleurs, en Chine par exemple. Et pour permettre ces délocalisations, il fallait une réforme du système financier lui-même. En 1985 a ainsi été mis en place un système de circulation permettant ce processus. Aujourd’hui, le discours a un peu changé. La crise ne serait plus le fait des syndicats, mais conséquence de l’effondrement bancaire et de la nécessité de l’État de les tirer d’affaire. L’État se pose en victime, ce qui permet d’encore réduire le pouvoir des syndicats. La situation fait écho à ce qui s’est passé en 1982 au Mexique, quand le pays était au bord de la faillite et que les États-Unis l’ont tiré d’affaire - avant de réduire le niveau de vie des mexicains d’environs 25 %. C’est ce qui se déroule actuellement dans de nombreux pays, y compris dans les pays industrialisés : les États imposent des ajustements structuraux de type FMI, lesquels ferment la voie à toute revendication sociale et populaire. Dans le même temps, les banquiers continuent de s’enrichir. Il y a deux ans, les dirigeants de hedge funds ont engrangé trois milliards de dollars de bénéfice. Je trouvais déjà cela obscène quand ils gagnaient 250 millions, mais là... Ce sont pourtant les mêmes qui ont coulé les banques d’affaire et imposé des mesures d’austérité en conséquence... Ils sont plus riches qu’ils ne l’ont jamais été, alors que les populations s’appauvrissent. Ce qui se passe maintenant en Angleterre, par exemple, est exactement ce qui s’était passé au Mexique à l’époque. Autre point fondamental : l’accès aux moyens de production, lié à l’environnement et aux ressources naturelles. Il en va ici de même que lorsque les capitalistes extraient de l’argent du système en le faisant tourner à vide ; et nous nous retrouvons face à des problèmes écologiques qui ne peuvent plus être ignorés. La crise écologique est aggravée par une élite propriétaire qui cherche à toujours augmenter sa rente. Face à la crise se développe une chasse à la terre et à la propriété tout autour du monde. Certains pays, comme la Chine (en Afrique) ou les États-Unis (en Amérique latine), vont jusqu’à acheter des portions entières de pays. Cela découle de la même quête de nouveaux profits que celle tournant autour la propriété intellectuelle, autre Eldorado du moment. Cette question de la production recoupe un deuxième élément : la situation du travail lui-même et la discipline imposée au travailleurs. Dans les années 1960 et 1970, je l’ai dit, les syndicats avaient du poids dans l’économie. Mais depuis les années 1980, le capital a aussi gagné sur ce point : il n’y a plus de syndicats pour les mettre au pied du mur. Autre point important, celui concernant l’argent et le surplus d’argent, donc le bénéfice. Pour se maintenir en vie, le système doit croitre continuellement. Et cette croissance requiert une augmentation de la demande effective. Deux éléments importants à ce niveau. De un, le système doit créer de nouveaux désirs et besoins pour se maintenir. De deux, les gens doivent avoir assez d’argent pour répondre à ces désirs par la consommation. Si on compare de nouveau avec la fin des années 1960 et le début des années 1970 - l’époque où on pouvait parler de constriction du profit -, on remarque qu’on est depuis passé à l’exact inverse : nous faisons désormais face à une répression salariale. Cette répression implique que la population a moins d’argent pour acheter les produits, ce qui débouche sur une baisse de la demande effective. La solution proposée ? Donner à tout le monde une carte de crédit et leur conseiller d’en faire bon usage. La dette des ménages a ainsi triplé depuis les années 1980, alors que les salaires stagnent. Le fossé s’élargit. Le collusion finance/État a délibérément distribué de plus en plus de crédits à des gens qui avaient de moins en moins de revenus. Voilà ce qui a amené à la crise des subprimes. À beaucoup d’égards, les subprimes ont constitué la clé et le déclencheur de la dernière crise. Mais il est important de souligner que ce que l’on a désigné comme une crise mondiale n’a concerné que certains pays, pas du tout la planète entière. il y a eu une réel inégalité géographique. Ici, nous faisons face à des politiques d’austérité ; mais ce n’est pas du tout le cas, par exemple, de la Chine, lancée dans un programme keynésien de développement, avec de gros projets et des banques qui investissent. La Chine a une croissance qui explose, autour de 10 %. Les gens qui traitent avec des partenaires chinois et évoquent la crise déclenchent chez eux une certaine incrédulité : de quelle crise parlez-vous ? L’Australie non plus n’a pas connu de crise, parce qu’elle exporte beaucoup de matières premières vers la Chine. L’Amérique latine a connu une crise très brève, notamment parce qu’elle devient une espèce de grand jardin de soja, avec des conséquences écologiques désastreuses. Bref, il y a là deux situations aux antipodes : d’un côté l’austérité, de l’autre le keynésianisme redécouvert. Nous assistons ainsi à une réorganisation totale du pouvoir géo-économique - Giovanni Arrighi parle à ce sujet de glissement hégémonique -, avec l’émergence d’une nouvelle puissance en Asie du Sud Est, qui fait concurrence aux États-Unis et - dans une certaine mesure - à l’Europe. Si nous nous focalisons sur cette dernière, nous constatons que le plus gros exportateur vers la Chine est l’Allemagne - qui ne se sort pas trop mal de la crise. En retour, La Chine s’intéresse à l’Europe comme débouché : elle est d’ailleurs en train d’acheter le port d’Athènes, pour organiser l’importation de ses produits en Europe. La raison pour laquelle j’aime raisonner en me basant sur des schémas de ce type , c’est qu’ils permettent de mettre précisément le doigt sur l’étape du processus qui fait obstacle au capital et provoque la crise. Les crises des années 1970 étaient très différentes car elles prenaient place dans une époque de répression financière, où les ouvriers étaient encore bien organisés. Ce n’était pas un problème de demande effective. Aujourd’hui, la crise est provoquée par le trop grand pouvoir de la collusion finance/État. D’où une situation de surexploitation : le système ne parvient plus à écouler sa propre production. Reste à savoir quelle solution va être choisie pour y remédier. La conclusion centrale que je tire est celle-ci : le système capitaliste ne parvient jamais à résoudre les problèmes qui provoquent les crises. Il se contente de les déplacer. De deux manières différentes : soit en les exportant dans un autre point du processus de production, soit en les déplaçant géographiquement. Si vous étiez en Asie en 1997 ou 1998, vous teniez un discours catastrophé ; au même moment, le monde occidental demandait de quelle crise il s’agissait. En 2001, c’était le tour de l’Argentine, mais nous restions à l’abri. Aujourd’hui, nous disons : il y a une crise. Mais le reste du monde répond : quelle crise ? Ces crises circulent, elles passent de la Californie à la côte Est, à l’Islande, puis au Portugal, à l’Irlande... Il serait d’ailleurs intéressant de savoir où la prochaine crise va éclater ; probablement à Shanghai, où le marché de l’immobilier est en train de s’emballer, avec création d’une bulle spéculative. Dans un de vos récents livres, vous dites : "Après le capitalisme, l’espace urbain : une utopie nécessaire". Qu’entendez-vous par là ? « Une des anecdotes que je raconte dans ce livre s’est déroulé alors que je présidais un jury en Corée du Sud. La discussion était dominée par deux architectes qui discutaient avec emphase : ils comparaient le pouvoir du carré et du cube, qu’ils opposaient à celui du cercle et de la boule. Au bout d’un moment, je suis intervenu pour dire qu’on devrait peut-être s’intéresser à d’autres questions. Qu’il fallait concevoir la ville en prenant en compte d’autres éléments que cette question de carré et de cercle. Par exemple : quelle sorte de relation à la nature proposaient ces constructions ? Quelles technologies étaient utilisées ? 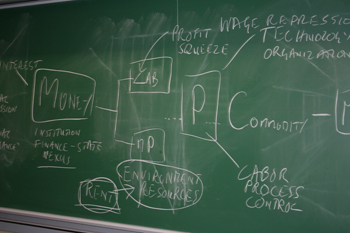 Quelles formes d’organisation ? 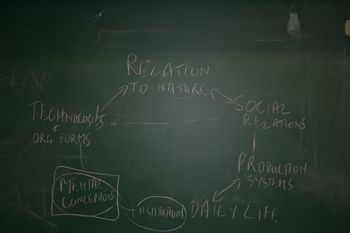 Et puis, quelles sortes de relations sociales étaient mises en avant ? Quels systèmes de production ? Quel rapport à l’espace ? Quelle vie quotidienne ? Quelles conceptions mentales ? J’ai tenté d’insister sur le fait qu’aucun de ces éléments n’était indépendant. Que chacun influait sur l’autre. La ville ne devrait pas être vue comme un produit fini mais comme un processus. Cette interdépendance des éléments ne concerne évidemment pas que les conditions d’urbanisme. Par exemple, on ne peut imaginer résoudre le problème du changement climatique sans agir à tous les niveaux, du mode de production à la vie quotidienne, du rapport à la nature aux conceptions mentales. C’est une forme d’utopisme dialectique. Pour résoudre un problème, il faut parcourir absolument tous ces aspects, n’en négliger aucun. La transition du capitalisme au socialisme implique cette approche ; ça a déjà été le cas au moment du passage du féodalisme au capitalisme. Cette conception peut servir de cadre dans un projet de changement urbanistique. Par exemple, si je veux changer les conceptions mentales liées à la ville, je dois solliciter tous les autres domaines, les parcourir scrupuleusement. Peu enclin à accepter qu’un penseur issu du monde anglo-saxon puisse rivaliser avec les Lumières hexagonales. Et organisée par l’excellente librairie Le Genre Urbain (30 rue de Belleville, 19e), à l’occasion de la parution de deux livres de David Harvey en français, Le Nouvel impérialisme (Les Prairies Ordinaires) et Géographie et Capital (Syllepses). Ce schéma, dessiné par David Harvey - comme celui reproduit plus bas -, a été photographié à la fin de la conférence. A noter : la retranscription écrite de l’entretien ne fait pas totalement justice à la limpidité du propos de David Harvey. D’abord en raison du filtre de la traduction, ensuite parce que sa conférence était pensée comme exercice oral. Il s’agit par exemple de celui placé au début du compte-rendu. La conférence ayant empiété sur le temps du débat, une seule question a pu être posée à David Harvey, celle-ci. La semaine dernière, Angela Merkel sonnait le glas du multikulti - modèle multiculturel - mais Gilbert Casasus, professeur et chaire en études européennes, nous rappelle que la religion et plus encore l'appartenance religieuse ont toujours joué un rôle important dans la vie politique allemande. L’appartenance religieuse des citoyens a toujours joué un rôle primordial dans la politique allemande. Les débats entre membres de l’église « évangélique » et l’église catholique ont fort souvent défrayé la chronique. Quant à l’influence de ces deux églises, elle n’a jamais été démentie par les faits. De surcroît, nombre de partis ont recruté leurs cadres et leurs futurs élus dans plusieurs organisations confessionnelles. Outre les différents ecclésiastiques qui sont venus garnir les rangs du Bundestag, on se souviendra que le successeur de Willy Brandt à la Mairie de Berlin ne fut autre que le pasteur Heinrich Albertz, que l’un des hauts responsables de l’église évangélique de la DDR, Manfred Stolpe a été le premier Ministre-Président du Brandebourg, avant de rejoindre le cabinet de Gerhard Schröder, et que la RFA a failli élire, le 30 juin dernier, un pasteur au poste de Président de la République. En effet, Joachim Gauk avait réuni un nombre important de suffrages sur son nom, contraignant son adversaire Christian Wulff à trois tours de scrutin. Certains hommes ou femmes politiques ont même confondu leur militantisme partisan et leur engagement religieux. Les plus anciens se remémorent ici des messes qui ont accompagné le mouvement pacifique des années 80, où nombre des sermons politiques se substituaient à des appels à caractère plus politique. D’autres évoqueront ici le rôle majeur joué par l’église luthérienne lors des premiers mouvements des citoyens est-Allemands qui, souvent réfugiés dans les temples, comme la « Nikolaikirche » de Leipzig, y préparaient leurs manifestations contre le régime de la SED. Quant à l’église catholique, elle n’est pas en reste, à l’image de ces cérémonies où les dirigeants bavarois de la CSU s’affichent volontiers avec les cardinaux et autres évêques de la région. En revanche, la laïcité, au sens français du terme, ne joue pratiquement aucun rôle en Allemagne, tant ce mot est inconnu par la majorité de ses habitants. Les Allemands préfèrent d’abord évoquer la « sécularisation » de leur société, considérant que le modèle français de la séparation de l’église et de l’État n’est pas adapté à leur pays. En ce sens, ils confondent volontiers laïcité et « anticléricalisme primaire », pensant même que cette même laïcité serait un pur produit socialiste, venu tout droit de la feue République démocratique allemande. Cette imprécision historique se retrouve aussi dans l’analyse faussée que beaucoup d’Allemands se font de l’Islam. Ainsi la Turquie demeure pour eux le pays islamique par excellence. N’ayant que peu entendu parler du Kémalisme, ils assimilent trop rapidement la pratique religieuse de nombreux travailleurs immigrés à la réalité politique et économique d’une Turquie dont les citoyens les plus ouverts, les plus européens, et par conséquent les plus attachés à la démocratie, ont sans cesse rejeté toute forme d’intégrisme et toute prise influence de l’Islam sur les affaires de l’Etat. A l’inverse du Président Christian Wulff qui lors de son très bon discours du 3 octobre dernier a reconnu l’appartenance de l’Islam à l’Allemagne, la chancelière n’a pas encore pris la mesure de cette nouvelle dimension religieuse, culturelle et politique. Parce que trop soucieuse de ne pas heurter l’aile droite de la CDU, mais aussi influencée par une vision très traditionaliste de l’Allemagne, elle vient de décréter la fin du modèle multiculturel dont la gauche allemande s’était fait l’avocate depuis près de trente ans. Ce modèle est toutefois moins exemplaire que ses défenseurs ne veuillent bien le prétendre. Il favorise certes l’acceptation de l’autre, mais réfute son intégration au sein de la société. Il est fondé sur le principe du respect mais non sur celui de l’égalité. Se voulant tolérant, il a aussi pour effet pervers de distinguer ce qui est allemand de ce qui ne l’est pas. Toutefois, telle ne fut jamais la volonté de la gauche allemande qui, en la matière, a certainement confondu générosité et diversité. Il n’en est pas de même pour Angela Merkel. Prononcé devant les jeunes de la CDU/CSU, soit devant la Junge Union connue pour ses positions doctrinales, son discours a provoqué de multiples réactions. Beaucoup y voient la fin d’une Allemagne plurielle. D’autres craignent même une recrudescence de la xénophobie. Mais au-delà même de la polémique, il se situe dans l’esprit de ce protestantisme luthérien qui peut même prendre des contours particulièrement rigoristes, voire dangereux pour l’ensemble de la société allemande. Alors que les protestants de gauche ont souvent oeuvré pour une Allemagne plus ouverte, ceux de droite ont parfois défendu les positions les plus scélérates que l’Allemagne a connues durant son histoire. Ainsi est-il bon de rappeler que, à l’exception de quelques personnalités comme le pasteur Martin Niemöller, l’Allemagne évangélique fut plus nazie que ne le fut l’Allemagne catholique. Bavière y compris. Angela Merkel est heureusement très loin de cette dérive intellectuelle. Néanmoins cette fille de pasteur demeure toujours influencée par une pensée luthérienne. Celle-ci, qui bien que se voulant réformatrice à l’origine, a aussi cautionné les pires affres de l’histoire allemande. … Il suffit de mettre en perspective par un commentaire approprié un reportage qui ne montre aucun usager exaspéré, alors même que les auteurs de ce reportage, vu des centaines de fois en toutes circonstances, ne disent rien de cette prétendue exaspération. L’abus des micros-trottoirs nuit gravement à la qualité et à l’équilibre de l’information. Et quand, comme cela arrive fréquemment, leur présentation en plateau ne correspond pas à leur contenu, voire est démenti par lui, cet abus provoque l’irruption de petites pustules de désinformation. Comissões de utentes dos serviços públicos decidem "formas de luta"
As medidas propostas pelo Governo no Orçamento do Estado estarão hoje, sábado, em análise na reunião nacional de comissões de utentes dos vários serviços públicos do país, que decorrerá em Lisboa e da qual poderão sair "formas de luta". As medidas propostas pelo Governo, como o aumento do IVA, a redução dos salários ou os cortes nas prestações sociais "vêm lesar ainda mais os contribuintes, os utentes e os trabalhadores", afirmou Carlos Pinto, do Movimento de Utentes dos Utentes dos Transportes da Área Metropolitana do Porto (MUT-AMP). "O país vive uma asfixia social e as pessoas não conseguem suportar mais esta carga fiscal", acrescentou. Sem avançar números, Carlos Pinto disse que espera uma "boa adesão" à reunião de hoje, sábado, onde vão estar comissões de utentes das antigas SCUT (auto-estradas sem custos para o utilizador), dos serviços de saúde, dos transportes públicos, dos correios, entre outras. "Uma das conclusões poderá ser a realização várias formas de luta, que podem passar por acções de rua em defesa dos serviços públicos, nomeadamente ensino, saúde, educação, transportes", avançou. A reunião nacional das comissões de utentes decorre nas instalações da Confederação Portuguesa das Colectividades de Cultura Recreio e Desporto, em Lisboa, e tinha o início para as 10.30 horas. Une opportunité d’investissement pour l’élite des affaires ? The tensions within the property market in Antwerp in the first half of the 19th century. An investment opportunity for the business elite? Pedro Davis es el actual presidente de la Conupia, organización que aglutina a los micro, pequeños y medianos empresarios, y territorio donde trabaja alrededor del 70 de la población chilena. La inmensa mayoría de los denominados “microempresarios” o “microemprendedores” de Chile, son en realidad trabajadores por cuenta propia que no tienen cabida en el mundo del trabajo formal debido al desempleo estructural existente que raya el 10 %, de acuerdo a cifras moderadas. Por otro lado, la concentración económica –movimiento del capital que se agudiza a diario- es la soga que pende sobre un sector de propietarios empobrecidos que mantienen una relación de subordinación respecto del gran empresariado de las industrias tutelares de la economía. ¿Cuál es la situación del área económica que congrega? ¿Qué ocurre cuando desaparece una mipyme? ¿Cuáles son las eventuales salidas a la crisis de las mipymes? ¿Es suficiente un programa de regulaciones? Las pequeñas y medianas empresas son proveedores del retail, ¿Qué relación existe allí? ¿Cómo les fue con el enuncio del último presupuesto nacional 2011? ¿Cómo es la sociedad entre el sistema financiero y la mipyme? ¿Qué fórmula podría emplearse al respecto? ¿Cómo les impacta el fortalecimiento del peso? ¿Cuál es el quehacer inmediato de la Conupia? ¿Qué pasa si no se atiende a la mipyme? El Tea Party ¿es el fascismo posible en EEUU? O outro lado de um "milagre estatístico"